On 5 December 2016, UNU-IAS convened the Water Style Summit with CDP 2016 Water Japan Report together with the Ministry of the Environment of Japan and CDP. The event brought together representatives from the private sector, investors, scientists, government officials and the general public to consider ways to promote partnerships among sectors to mitigate water risks. In the opening session, Kazuhiko Takemoto delivered remarks highlighting the importance of global multi-stakeholder partnerships among governments, the private sector, investors and individuals in order to meet SDGs. 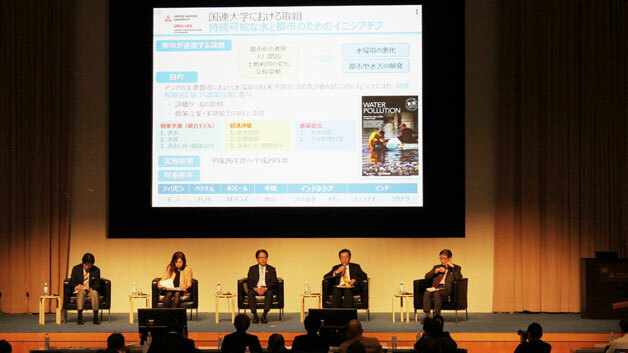 During the event, CDP’s official Japan report on corporate water information was presented. The report summarizes the state of play in the corporate disclosure of water risk management policies, followed by presentations by Water A-List companies which understand the business imperative behind the sustainable management of water and are acting to improve water safety. The conference also included a presentation by Dr. Hideki Harada, a professor at Tohoku University, on “Water and Sanitation in Developing Countries-Development for Appropriate Water Reuse Technology.” The presentation highlighted the current state of water disposal in developing countries and development of technologies to improve these situations. Following Dr. Harada’s presentation, two Japanese municipalities, Hokuto city and Hadano city, presented their activities to utilize and protect local water resources. During the panel discussion, Dr. Takemoto highlighted UNU-IAS’s contribution to facilitate multi-stakeholder partnerships, locally and globally. He explained that, at a global level, UNU-IAS seeks to further support developing countries through cooperation with ESCAP. On a local level, he stressed that UNU-IAS has been contributing to engage different stakeholders and offering policy advice through its research projects and outreach activities. The event concluded with remarks by Mr. Takejiro Sueyoshi, stressing the importance of tackling the issue of water as a global problem and taking action on a daily basis.